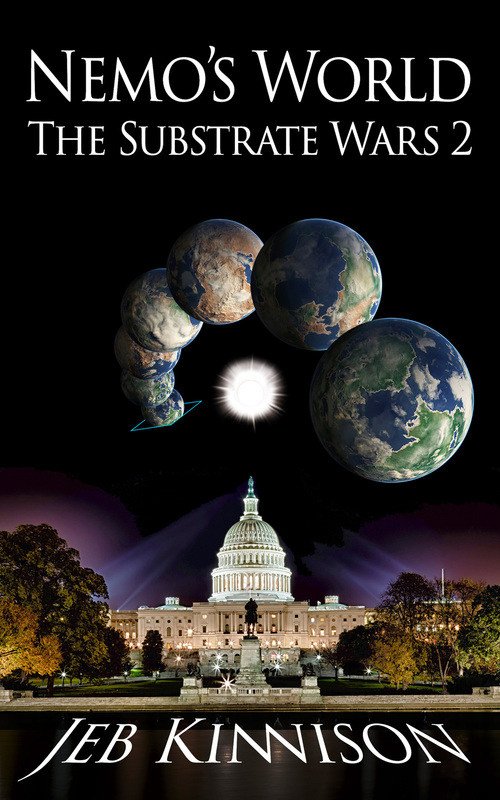 Nemo’s World: The Substrate Wars 2 is now available in Kindle format on Amazon. In Red Queen, student rebels discovered quantum matter transmission and used it to escape US Homeland Security. Nemo’s World has them battling the governments of the Earth to dismantle the doomsday devices and police states that are suppressing freedom and endangering humanity’s future. In this thrilling sequel to 2014’s Red Queen, the student rebels have escaped Earth, but the US and Chinese governments continue to try to copy their discovery of quantum gateways to find them and destroy the threat they represent to security interests. The rebels hold off Earth government attacks and continue to develop the new technology, which will change life for everyone and open a million habitable planets for colonization. Samantha and Justin are the romantic couple at the center of the rebellion, and their fellow rebels include anarchist cyber-geeks from the Grey Tribe and some of their former professors. The rebels recruit a PR specialist from London, Daniella Pink, and begin a campaign to fight the propaganda governments have used to paint them as dangerous terrorists. When the US effort to copy their technology, led by Samantha’s former boyfriend Dylan, gets too close to success, the rebels destroy his multibillion dollar secret lab carved into a Colorado mountain. The Homeland Security surveillance the rebels suffered under in Red Queen is reversed, and the US President and security agencies discover they must go to great lengths to avoid the rebel’s listening ears. Nemo’s World continues the cat-and-mouse game with the governments of the world as young rebels learn to use the weapon that will change the world, and unlock the universe for mankind. If they live long enough to use it! Posted in Books, Government, Science Fiction and tagged artificial life, homeland security, nemo's world, nemo's-world-the-substrate-wars, personal freedoms, quantum gateways, quantum transport, red queen: the substrate wars, review, substrate wars on March 12, 2015 by Jeb Kinnison.